Sam had an idea to make zucchini brownies, and they were a (sneaky) hit. 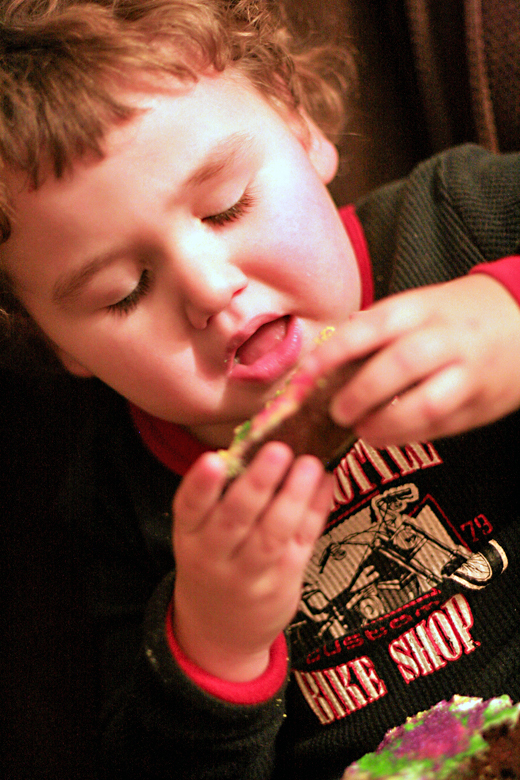 Mikko added his own inimitable touch by emptying pretty much all our cake sprinkles onto the top. They were quite pretty. He loves helping out with the preparation. 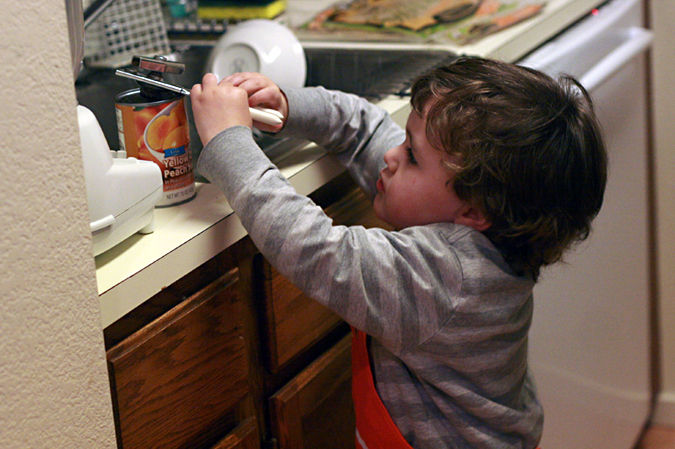 He's decided his Home Depot apron is perfect for kitchen duty, and he fished out that can opener by himself and then helped push the blender button so Sam could make him a peach and yogurt smoothie. Which he never drinks anymore. But maybe someday he'll start up again, yes? He told me the baby was hungry and I needed a snack. 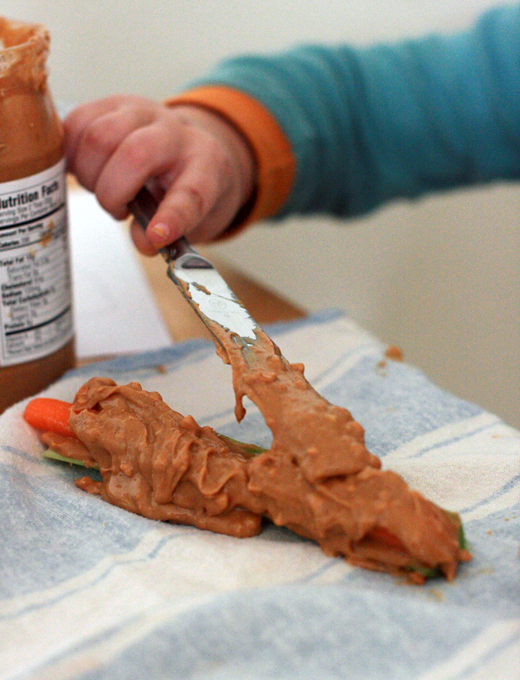 He decided on a favorite treat of mine — celery with peanut butter — and threw in carrots for good measure. He got it all out himself and — obviously — did his own spreading job. Now, he won't eat any of those ingredients personally (and was icked out by the peanut butter sticking to his fingers), but I was touched that he made it for me. My little guy, who has more true knowledge about the joy of food than I'll ever regain. When I was little I ate EVERYTHING seriously there wasn't a veg I wouldn't eat. Then over night I stopped, but I grew back into it again... honest! So cute - Love the peanut butter smile!! Yum! Sounds like my kids that they like making the food but not eating it. My oldest was picky until she started preschool. The snacks at school were healthy so she will eat apples and carrots for "treats" now. My youngest is going through the "non eating" phase still. I am hopeful she will start eating more again soon. Seriously, how can they survive on so little?? 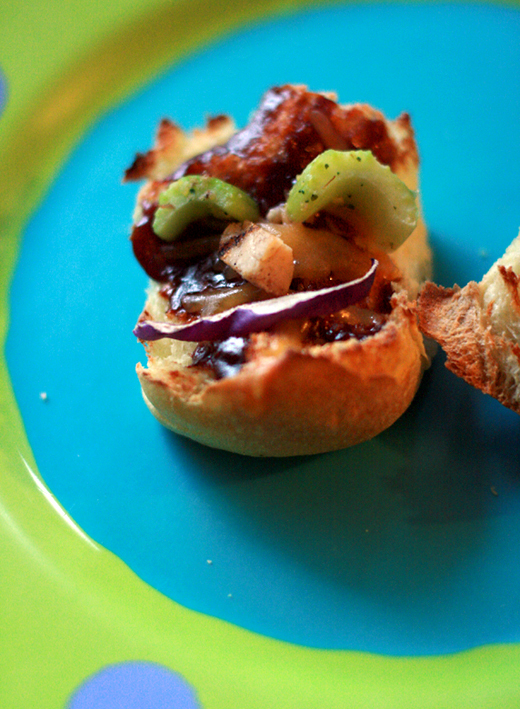 That is one seriously good looking snack! Oh, the hell of trying to feed a picky eater. 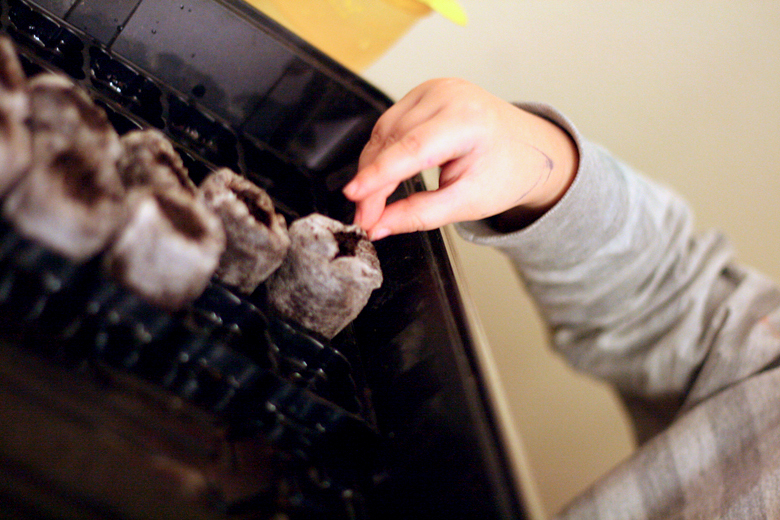 We pretty much eat the same 5–6 meals every week, featuring the veggies that the Critter will actually eat. I like the zucchini-in-brownies idea. I bake a batch of muffins for the Critter's breakfast-before-school each week; he'll eat just about any kind of bread, so I bake fruits or veggies into the muffins—bananas, apples, sweet potatoes, etc. Oh, Lauren! I think you're being too hard on yourself. And have some faith. I hope you regain a healthy relationship with food. And Mikko will get there. I think it is important not to force ANY food issues with kids. I'm paranoid of creating food issues. And I am such an emotional eater. Still visiting from Natural Parents Network! Oh! And that snack he made ~ SO sweet of him! As for brownies, you can also replace the oil with black beans, but I haven't gotten the recipe quite right. If you get it right, you can't taste the beans at all! Lauren, I completely agree that it is the relationship with food that is even more important than the nutritional value. I really believe a relaxed, non-coercive food environment is what benefits children in the long term. I happen to have NON-picky eaters, thus all the raw veggie pics this week. So please don't stress and compare with others. Mikko is blessed to have such a pleasant and happy food relationship(be it broccoli or french fries)! I've never been a picky eater but my husband is TERRIBLE. I'm hoping J will fall somewhere between us and she loves food so far but we've had a very laid back approach thus far. Hopefully her healthy appetite keeps up throughout her toddler years here! 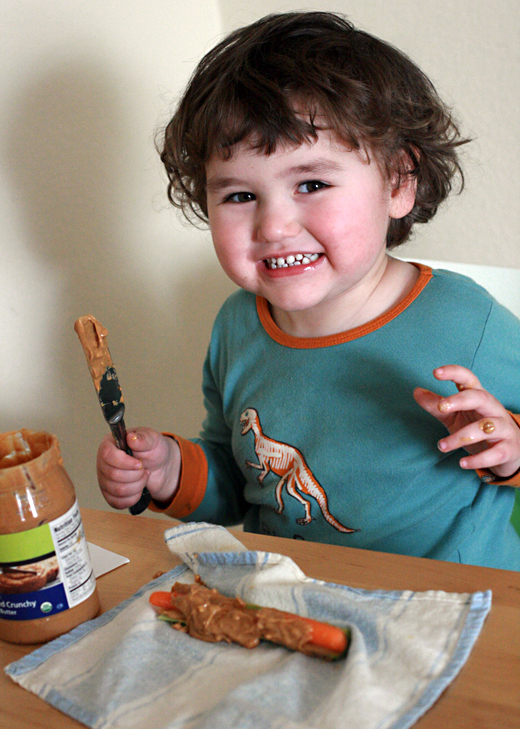 My older child went through a stage where he ate almost nothing but peanut butter. At 4.5 he's getting much better. You're giving him a lot by allowing him to explore like that. oops!! I entered the linky because I thought it was about healthy eating and I just wrote something along those lines recently. But then I realized it was for wordless wednesday! Sorry! Feel free to delete it. Togetherness--work or play--makes for great family. Good job. I think keeping your food environment low stress is the best way for Mikko to have a good relationship with food as an adult. And for you too. Eat the foods that make you happy. The unhealthiest (adult) eaters I know either had parents who never offered them anything they didn't like, or were forced to eat things they hated and never offered any treats at all.